I love that in the time short time I’ve been in the digital marketing industry, I’ve seen massive changes from being in a position where I was once inferior to the ‘powers that be,’ to actually having a voice and a pretty on point perspective of what actually works and doesn’t work. Something that took the previous generations years to figure out, is being solved in a much shorter space of time – Given the extreme amounts of information that’s being downloaded every second, to the vast amount of connection that is taking place; not just locally, but globally. The global part may not be news to you, but in the perspective of business marketing and digital marketing. This explains Google Panda, and Penguin, and to those who are not familiar with either of these. They relate to a bunch of guidelines, or boundaries that Google have put in place to stop black hat marketers cheat you out of your money, and sell you bad links, or anyone trying to cheat a game of fair play. It helps us the business owner choose a better fitting glove for our business when looking to partner with outside companies, etc. And it helps the consumer have a varied pallet to choose from – Hopefully giving them a better selection of genuine businesses. What do I mean, by ‘genuine ‘ people who’re in business for all the right reasons, and not for a quick buck. Oh yes, it goes that deep. I’m getting a little tired of hearing the selected few of so-called ‘professionals’ struggling to make the switch between Social and SEO. Social is a completely different ball game. This regimented way of thinking that it’s all about the rankings and ‘giving Google what it wants’ is from my perspective foolish. It’s so much more. It may be a bold statement to make, but I solidly believe that social requires a whole new way of thinking. It can’t just be about the rankings anymore, it’s about the end user remember? We’re moving from the 3D generation, and into the 4D era. The pitch you were using way back when just doesn’t cut it any more I’m afraid. Chasing Google is not the answer to selling more products, although having a presence and optimizing your site is imperative, don’t get me wrong. Rather, I’m addressing the attitude that shows a complete disregard for social and it’s true ROI, which are people! Some people are missing this exact point, and buying into the chocolate covered apple. Appearances can be deceiving. Make sure if you are going to work with someone outside your company that they are fluent in social. Getting on the front page of Google means diddly squat if your product or service isn’t remarkably good, or remarkably cheap. If you really care about the end user, then sure I can work with you on ‘giving Google what it wants,’ and talk through social signals, and share value with you. However, I also believe that if you get the ducks in the right order, the water will part. 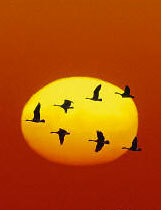 Have you ever noticed that when a flock of birds fly together they form a V shape? The V formation as it’s commonly known, allows the birds to lighten their load in flight by sharing weight, reducing induced drag, which in turn increases flight efficiency especially over long journeys. There is a massive merge happening in the world of on line marketing. SEO and Social will continue to merge through-out this year, and if you don’t want to miss the boat… Make sure you are on top of the water, not under it. If your thinking about investing in digital media this year, then by all means go for it. Just make sure you’ve done your research and explored every avenue before choosing your route. Honest really is the best policy. So make sure you partner with someone who can back up what they say they can do. It really is unfortunate that there will be people out there who will happily take your money and run, or rip of your work at the drop of a hat. Not all of them, but there are a few. Make sure you do your research before you enter into a contract. If you’re not up to speed with the land of digital marketing, then take your time and get there. Don’t be afraid to ask the questions until you understand. The good news is… Googles January update, which was announced in a post, on the Insights blog on Friday. Will now make life extremely hard for anyone who doesn’t follow the correct processes. For more information on that, click here. If you’re looking for advice on buying a product that you know nothing about, you might type it into Google, and read a few forums related to the desired product, but are you more likely to listen to those anonymous people who might respond to your question; or are you more likely to go and ask the designer two seats down who is more than familiar with the industry and products already?